Another month has passed and we have officially entered 2019! It really is unbelievable how quickly the year has passed us by, especially in my case. Working and blogging has kept me busy, and with school set to resume in a couple weeks, 2019 will no doubt be a busy year. 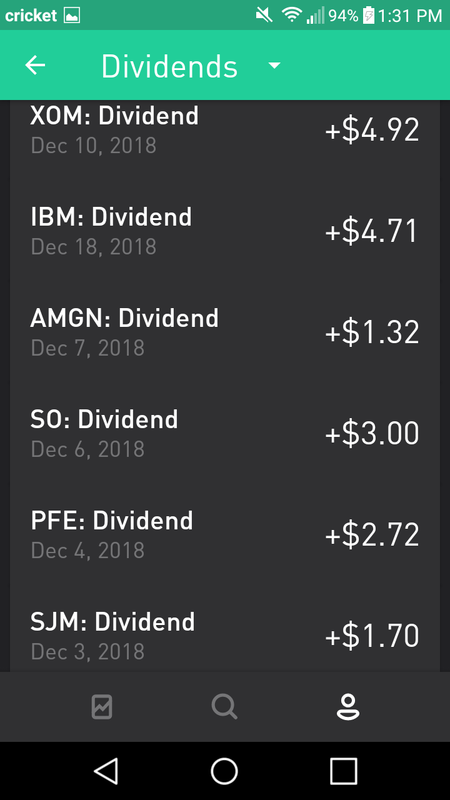 Anyways, with the passage of another month, it's time for me to delve into what December provided for me in terms of dividends. 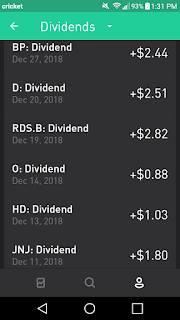 Overall, I collected a record $53.84 in dividends in the month of December. This represents a 21.7% growth in dividends collected compared to the $44.26 in dividends collected in September. This means that in 2018, I collected $360.92 in dividends between my taxable accounts and my retirement account. 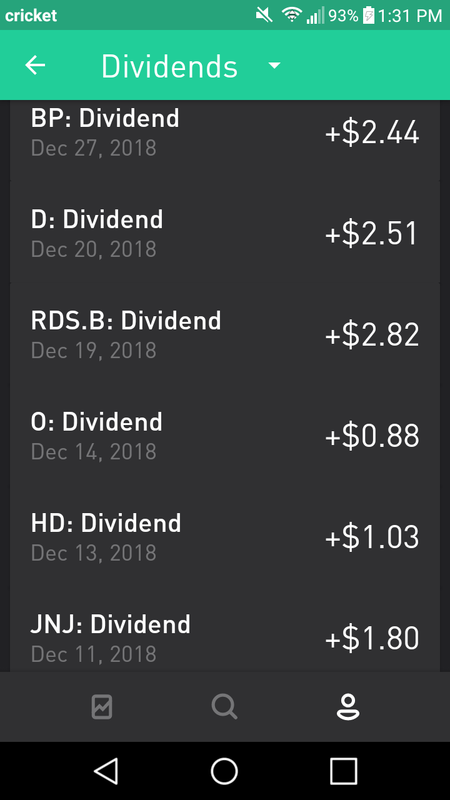 Of the $53.84, I received $29.85 in dividends from 12 of the 32 companies in my Robinhood portfolio. This is less than the $31.73 I received from my Robinhood portfolio in September as Pepsi (PEP) won't be paying their dividend until January. 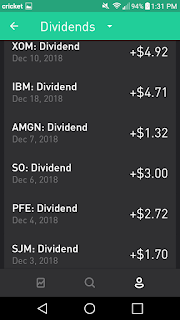 The amount received from my Robinhood portfolio is identical to September's dividend income besides the absence of the Pepsi dividend that was discussed above, as I have received no dividend raises and invested no new capital in any companies that paid me in December. I also received a record $0.44 from 24 companies in my M1 Finance portfolio. 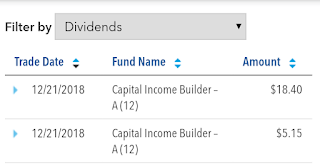 I haven't added any new capital to my M1 Finance portfolio since I opened it back in September, so the dividends will continue to be a rather small percentage of my total dividends. I didn't include screenshots for M1 Finance, as the dividends have been grouped together, rather than separated out in an even somewhat orderly manner. 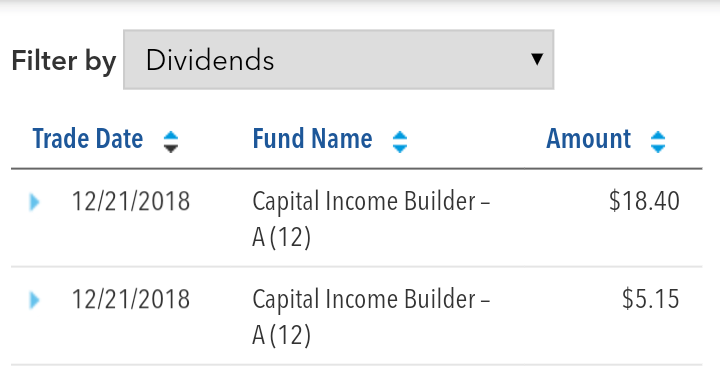 Lastly, my mutual fund (CAIBX) in my retirement account paid a record $23.55 in dividends, with $5.15 of that being special, year-end dividends. The retirement account dividends increasing have been the constant for the end of quarter dividend income reports. Factoring out the special dividend, the $18.40 in usual dividends that I received in December compared to the $12.49 received in September represents 47.3% quarterly growth. However, the most impressive growth can be observed when we compare December 2017 dividends of $12.80 to the $53.84 collected in December 2018. A 320.6% YOY increase that was mostly as a result of my retirement plan contributions in 2018. A quadrupling of dividend income in a single year! Sign me up for that! December was yet another month of considerable dividend growth. I expect this trend to continue throughout the year for every month of dividends, with end of quarter months containing the most growth due to retirement contributions. The real fun will begin in 2020 when I am several months removed from completing undergrad and will finally be able to aggressively funnel most of my earnings into investments. Was December another record month for you? Did you have any new dividend payers? Good job always great to increase your dividend YOY keep it up. Thanks for the comment, D&H! Let's keep rolling our dividend snowballs down the hill and making every dollar count! Kody, Kody! Excellent month right there. Over $50. Impressive stuff right there. On top of it, that is an excellent group of companies that paid you a dividend this month. Great job! Thanks for the comment! It's certainly a great feeling breaking over $50 for the first time. The dividends are only going up from here on out.